Those who know me recognise I have ‘previous’ in this area. As Chairman of ISA in 2002, during our Annual Conference, I called for the end of Key Stage 1 and 2 Assessments. At the time, it was sufficiently interesting that national press and regional radio cottoned on. What concerned me then, and what concerns me now, is for a curriculum to inspire, there must be time for pupils’ interest, aptitude and skills to grow. At some stage during the development of Assessment & Learning over the past 40 years, we have got much of it right. The trouble is, when we have for English (for example) we haven’t for Maths, yet when reorganisation happens it happens across the board – moving the target for Maths onto some shorter term functional assessments might be a good thing (can they pass a Numeracy paper for example, such as the Proficiency in Arithmetic test run by the AEB in the 80s and early 90s), but that’s not the way forward to assess creative writing. You don’t move dartboards so that wayward arrows hit the bull! Anyway, you can read the whole Press release below – of course I am hugely proud of our pupils’ achievements, boys and girls, and I say that all the time, but they and I know too that by and large their education has been diminished by the repetitive testing they have endured to 16+. And they get to continue that way to 18 too. Now in some ways, modules for A levels has led to significant improvements in tracking pupil progress in the final 2 years of pre-University education, with no GAP Year 12 enjoyed by the lazier student. Exam boards have learned from the past and have reduced numbers of modules, and with only three or four subjects on the table, the demands are less onerous. The key failure however that still arises at this level is that we simply don’t have confidence in the assessment process. If a 41 out of 50 raw mark can be published as 73%, regressed by the exam board so that it reports fewer A grades, natural justice is not served. Of course you have got to take account of the difference in difficulty of papers and find some mechanism for adjustment, so that one season’s A matches another in a subject, but Chief Examiners across the land confirm privately that this regression is more than that. Political masters will not see grade inflation, so force this tinkering which discredits the process, because the assumption is that the Raw score mark is correct. Now actually for many subjects, up to a 10% variation can happen in the natural way of things. One candidates tightly drawn and constructed arguments might actually be too good for an inexperienced marker to see. So 41 could actually be 45, and score 85% say, confidently into the A band! Any way, such arcane discussion about Exam board practice rather takes me away from the main thrust of this message, which is that the curriculum assessment must support education not damage it! 113 candidates sat 1138 GCSEs, pass rate 99.8% (A*-G), 80% pass rate A*-C.
87% of candidates gained 5 or more GCSE higher grade passes, and 76% including English and Mathematics. Claires Court remains unusual as an Independent school in that we are not selective on Academic ability. For some of our pupils, gaining a hatful of A* and A grades is the target, and for many others, securing a higher grade pass alone is the result they seek, opening as those do access to A level and equivalent courses at Sixth Form level. Once again I am delighted to report excellent GCSE results for our boys and girls, gaining similar results in recent years with 87% gaining 5 or more GCSEs including English and Maths. With individuals actually averaging over 8 GCSE higher grades ahead, most are have made their major target, being now well set for A level courses in our own sixth form and elsewhere. We consider ‘outstanding scholarship performances’ to be for all candidates with at least 5A grades, and 21 of our pupils have reached that standard. Best male was Joe Curran who gained 5A* and 2 As, best girl was Michaela Lawson who gained 4A* and 5As. Other Star candidates include Headboy Ben Aldren and Head Girl Jo Beck who both gained 8A*/A, Kirah Bradley and Chester Camm both gained 3A* and 1A in Maths and the sciences, with Chester gaining an A grade in A level computing adding a real extra to his challenge to be our best number cruncher! Sarah Allerton, Aaron Bhalla, Alex Corrigall, Alex Fyfe, Ashleigh Richards, Jessica Evans, Ellie Griffiths all gained at least 6 or more A*/A, with English, English Literature, History Maths, Sciences Religious Studies, Physical Education and Spanish leading the way at departmental level across both boys and girls. More generally, it is really pleasing to see that the nation’s focus has returned to encouraging pupils to pursue traditional subject-based disciplines, recognisably our ‘offer’ at Claires Court.. Personally I believe most young men and women are best prepared for A level and University by following subjects that are known to be rigorous and that encourage depth of thought and application of skills to answer challenging questions. Longer term, we are not best served by modular examinations that stretch from age 14 to 18, which inevitably focusses attention on the ‘test’; students need time to develop and take responsibility for their learning, develop innovation and excitement in equal measure for their studies. Of the leading world nations, we are the only one that requires such intensive examination throughout the secondary phase. 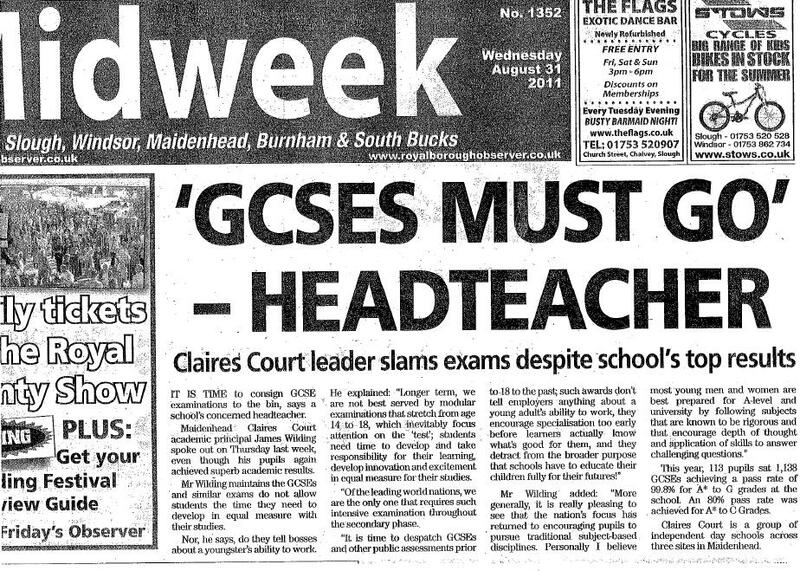 It is time to dispatch GCSEs and other public assessments prior to 18 to the past; such awards don’t tell employers anything about a young adult’s ability to work, they encourage specialisation too early before learners actually know what’s good for them, and they detract from the broader purpose that schools have to educate their children fully for their futures! Not withstanding these reservations about GCSEs in general, I am very proud of all of our pupils’ achievements this year; in academy, sport, the arts and community involvement, Claires Court’s 16+ cohort are well set to play their full part for the future.